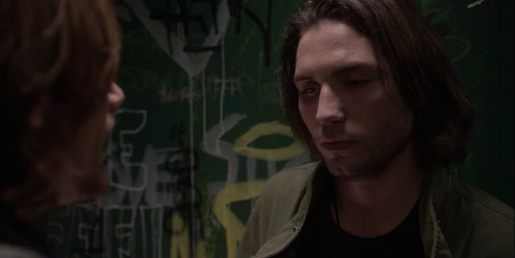 Hindsight 1.10 Sneak Peek: Has Jamie Ruined His Life? Jamie knew when he started in the drug business with Stanton, it would be a risk. Not only was he stealing prescription pads from his father, he was dealing with unsavory clientele that would take advantage of him at a moment’s notice. He needed to have his guard up if he wanted to make the type of money he needed to get through school and keep himself afloat, all the while ensuring that his father never found out what he was doing. But as much as Jamie might’ve been enjoying the newfound wealth he acquired through his dealing, that type of riskiness, which he once deemed worth the potential reward, was bound to catch up to him. On the season finale of Hindsight, Jamie returns home and finds his place ransacked by an unknown intruder. Gone are the money he had hidden in his room and the prescription pad he and Stanton were working through. The latter is especially concerning, considering that if Lincoln is made aware of the missing pad, it wouldn’t take much for him to trace its disappearance back to his son. One of the major motivators in Jamie getting involved with drugs in the first place was the need to please his father, to prove to Lincoln that he was able to take care of himself; however, in pursuing success through illegal means, Jamie unnecessarily put his relationship with his father on the line. The easy money and the quick turnaround his life would take overrode his sense of self-preservation and familial loyalty, to the point where he could lose everything he worked for and everything he had when he first got into the business. If Lincoln finds out about the pad, he would sever ties with his son for good and likely send Jamie spiraling toward the same fate he suffered in Becca’s past, further proving that the universe doesn’t take kindly to outside influence. Elsewhere on Hindsight, Becca and Lolly’s friendship struggles to recover after Lolly witnesses a kiss between Becca and Kevin, while Sean tries to get Paige to be his date to the art showcase. The season finale of Hindsight airs Wednesdays at 10:00 on VH1. You can check out a recap of the most recent episode here, as well as KSiteTV’s argument as to why VH1 should renew Hindsight here. Will Jamie be able to recover the prescription pad and keep his father from finding out that he stole it? Is Lolly ever going to forgive Becca for kissing Kevin or is Becca’s future too dead set on repeating itself? Should Paige accompany Sean to the art showcase, even if Noelle is going to be there?